Lorraine Dell is getting ready for a night out with her fiancé Sean Kilbride. It’s freezing outside, but inside it’s warm, music is playing, all the lights are on and the curtains are wide open. Life couldn’t be more perfect. But when a knock comes at the door, everything changes. Utterly gripping, fast-paced and nail-bitingly tense, this serial killer thriller will keep you up reading all night. If you love Angela Marsons, Rachel Abbott and Patricia Gibney, you won’t be able to put this down. 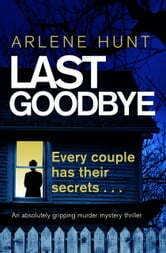 I enjoyed the twist & turns of this book, easy to read and I couldn't wait to reach the end. Well written, little disappointed that the wolf wasn't revealed more as the wolf or did I misss something?? Keeping it in my book list as I may read it again sometime. Thanks Arlene Hunt for becoming a writer. It was ok. I feel like it needed more. I didn't get the time to build a connection with the characters, or to fully understand the psychology of the killer. It was all a bit superficial I thought.